Fuel Up Only With Free Stuff You Find Along The Route: Berkeley To Vegas, No Petroleum! The City of Berkeley is now a maximum security statist dystopia… Cars are illegal… Petroleum is a controlled substance… Now, geeks and gearheads unite to escape from Berkeley by any non-petroleum means necessary! That's right, a 600-mile race in vehicles not only prohibited from burning petroleum-based fuel but prohibited from buying any fuel whatsoever along the way- it's all got to be obtained free along the route. 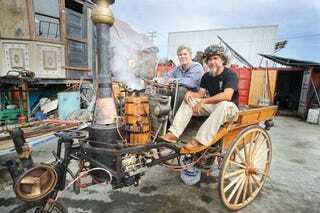 Steam-powered cars burning wood chips left behind by tree-cutting crews! Gasifiers converting dead possums and heaps of fast-food wrappers into go-go-gas! Batteries charged by sweet-talking locals into allowing power-outlet access! Mules eating grass! Whatever it takes! The race starts tomorrow morning and I'll be making the jaunt from nearby Alameda to check it out- come back tomorrow and you'll see some of these dystopia-fleeing machines.